Stare at the + and only the + . Do this long enough and the picture behind it will disappear. Keep reading to find out how this works. When our eyes stare at something long enough, our brains stops us from seeing anything else. Now don’t go staring at yourself in your family picture waiting for your little brother to disappear. It’s not that simple. Our brains can only do this if the objects around what we’re staring at are not very detailed or bright…no this still does not include your little brother. 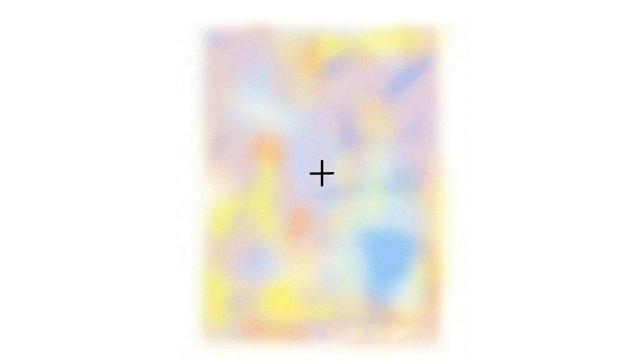 If the object is too bright, our eyes can not keep focused on the thing we’re staring at and begins to, slighty but very quickly, peek at the surrounding objects. This is why whenever you look at someone very closely their eyes are constantly moving. Even if their looking at just one thing.